Want to move up to a better binocular but can’t afford the high-end optics? Need a second pair for your significant other? Or maybe you’re a world-class grandparent trying to get a favorite kid a life-changing present. This review’s for you. 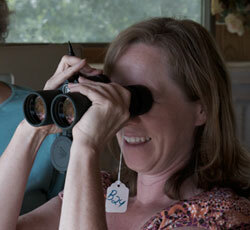 In this article, we review moderately priced binoculars in the 8x42 size class. All the binoculars are street priced between $200 and $600 and have 8-power eyepieces and 42mm or slightly larger objective lenses. All the binoculars that the manufacturers sent to us for this review were H-shaped, roof-prism designs. No one sent a Porro prism design. This reflects the clear trend today in the birding market for the more compact roof prisms. Why choose 42mm objective lenses? More resolution. All other things being equal, the larger the objective lens, the better the resolution in the image. But you pay, with increased weight and size. How much resolution you need depends on how much you’re going to magnify an image. For 8- or 10-power magnification, a 42mm objective lens provides plenty of resolution. There’s no need to exceed your eye’s ability to see. The reason people might choose larger objectives would not be for increased resolution but for more brightness when night viewing or star gazing. Brighter sometimes. An 8x42 binocular creates a 5.25 mm exit pupil (42mm ÷ 8 = 5.25 mm). The exit pupil is the diameter of the column of light coming out of the eyepieces. A larger objective lens provides a wider column and more light entering your eyes when your pupils dilate at night. The average youthful eye pupil dilates only to about 7mm even in total darkness. As we age, our eyes’ ability to dilate gradually diminishes, so a 5.25mm exit pupil probably delivers all the light your eye can use, even in dim-light conditions. Therefore, a 42m m objective is a good, practical choice. In daylight, when your pupils contract to about 3mm, most of the light coming out of the binocular will fall outside the pupil and never enter the eye at all. Making the exit pupil even larger won’t make the image look any brighter. Easier to use. However, an exit pupil that is bigger than the pupil of your eye is sometimes useful. It’s easier to position your eyes in the column of light. Helpful if you have shaky hands or you’re on a boat! Focus mechanism. Your primary interaction with a binocular is focusing. It should be an intuitive, transparent experience. There should be little or no slack. One achieves the best focus by turning past the sharpest point and then back to it. Slack in the focus mechanism messes with this strategy. Also, if you detect sloppiness while turning the focus knob, it raises doubts about the binocular’s overall construction quality. The knob should turn absolutely smoothly throughout its whole range. There should be no hint of dragging or noise. The turning resistance should be enough to prevent unintentional movement and give good kinesthetic feedback, but not too stiff. In order to make fine adjustments, you should be able to initiate turning the knob without a jerk. People vary in how much turning resistance they prefer. Therefore we did not ding a binocular’s score unless we thought the focusing was clearly too stiff or too loose. The focus knob should have a non-slip surface, so that the fingertip gives a secure tactile feedback and tells your brain that you don’t have to push down hard for traction—just move your finger. A soft rubber surface with a pattern or ridges works well. Fit-and-feel. 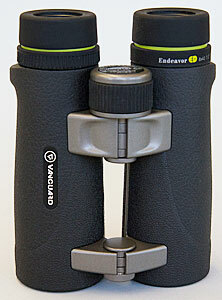 Ergonomics plays a big role in choosing a binocular. Because optical quality has become very good in recent years even in mid-priced binoculars, fit-and-feel may well be the deciding factor in choosing one binocular over another. Is the binocular comfortable to hold? How does the armor coating feel against the skin? Is it grippy enough, without being annoyingly rough? Do the strap lugs dig into the hand? Are there any sharp edges? Are there any bumps, depressions, or ridges that work well only for a hand of a certain size? Is the binocular well balanced? How intuitively does it aim? How comfortable is it to reach the focus knob? Diopter Adjustment. The diopter setting lets you customize a binocular’s focusing to accommodate any differences between your two eyes. The setting will differ from person to person. You should have to set the diopter only once, unless you lend your binoculars to someone else, who changes your setting. The best diopter mechanisms lock, so that they can’t be changed accidently. And they have an easy-to-read scale, so that you can return to your preferred setting if it does get changed. The worst diopter mechanisms have neither lock nor scale and are located where they are likely to get changed unintentionally. Resolution. As in previous reviews, we tested optical resolution using a USAF-1951 optics resolution chart. 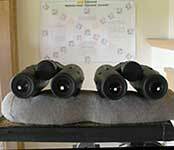 We used a beanbag rest that let us carefully compare two binoculars side by side. A halogen floodlight provided consistent lighting. In case of ties, we had a 2x doubler handy to place behind the eyepiece. The human eye’s ability to resolve detail can change due to fatigue or time of day. As a control for consistency, we used a high-end binocular to continually check the level of details that our eyes were able to see. We mapped the resolution results so that the top score was 5. One should note that the resolution scores in this chart are very close. Adjacent gradations represent differences that can be seen only from an absolutely stable platform, and possibly only with a doubler. We know you’re curious how these mid-priced binoculars stacked up against our high-end reference binocular, so we’ll tell you. The high-end binoculars’ resolution score would be a 5.5. It’s wisest to use the chart data as a rough guide and not to obsess overly on a resolution score difference that you might be unable to see in the field. Furthermore, it’s possible that the one sample of each binocular we studied could have been atypical. The best use of this chart data is to help you narrow down your choices to a few binoculars that you can test personally and find out which one suits you best. 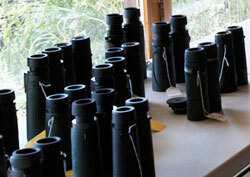 Choosing a binocular is always a very individual and holistic task. In order to integrate more opinions into our test, we invited some local birders for a testing day. They had access to the same testing tools we used to compare binoculars. We have integrated their evaluations and comments into the reviews. The chart is sorted by overall score, with the best at the top. We scored the focus knob, diopter mechanism, fit-and-feel, and optical resolution on a scale of 5 to 1, with 5 being the best. The overall score derives from these four categories, with the optical resolution weighted most, focus knob and fit-and-feel next, and the diopter score least. Close focus, field of view, eye relief, and size are not scored, because people’s concerns for these features vary individually. However, the actual specifications appear in the chart. The street prices were determined by market research as of October 2011. They are not written in stone. There isn’t enough room in this article to review each binocular individually. However, click the "Binoculars of note" link below to see binoculars that we singled out because they were top scorers or good buys, or because they were interesting in some other way. We did not write individual reviews of all the mid-priced binoculars in our study. However, a few stand out as examples of excellence or good value. Scores have a maximum possible of 5.0. Click the links to read the individual reviews. For each binocular, the chart shows the manufacturer’s specifications, which are from the manufactuers, codes indicating the eyecup style, diopter location, diopte scale style, the five individual scores from our tests, and an overall score. In every category, the highest possible score is 5. The overall score weights resolution more heavily than the other scores. The scores are relative to this review only and do not correlate with similar charts from other reviews. Click on the chart below to enlarge. We tested and evaluated 29 mid-priced binoculars for this review. Each one had a street price of under $600 and over $200. The Vanguard Endeavor got the top overall score, even though it’s priced at a modest $350. Its 5.0 resolution score tied for top place. When we did comparative resolution testing, it equaled the resolution of a $600 binocular! It’s an open-bridge design with outstanding optics and ergonomics. It’s slimmer and shorter than the other open-bridge binoculars in our study. Its armoring is a soft, textured, very grippy surface, as hand friendly as it gets. The strap lugs, which are also armored, gently curve out to protect the hands. The focus knob has no slack and provides just the right amount of resistance. 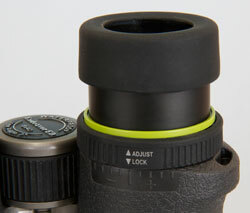 The focus knob’s surface is soft, rubbery, and deeply grooved. A three-quarter turn takes you through the entire focus range. The diopter adjustment mechanism is neatly made and has a lock. A concave area on the bridge provides a natural resting place for your middle finger, positioning your index finger in line with the focus knob. 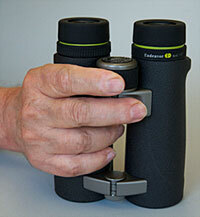 This small ergonomic detail means you tend to grip the binoculars the same way each time. A consistent grip assists the kinesthetic intelligence you use when instinctively pointing binoculars at a bird. Vanguard has been around for over 25 years, but in the last few years they've gone into optics in a big way. Because Vanguard owns its own manufacturing facilities in China and has its own in-house optical engineers, the company has complete control over the design and product quality and can hold down costs. We were looking at the 8x42 model for the review, but there are four Endeavor EDs. Here is a brief guide to the other three. 8.5x45 If you want a smidge more magnification, you might consider this 8.5-power model. Because of the slightly wider 45mm objective lens, you sacrifice nothing in brightness. It's a fraction of an inch longer than the 8x42, and it weighs only an ounce and a half more. It has the same 19mm eye relief as the other Endeavor EDs and also works great with glasses. Highly recommended. 10x42 A very nice 10-power model. It's the same size, weight, and price as the 8x42. What's unusual about this Endeavor is that it has 19mm of eye relief, which means it works even for a person who is wearing glasses. Most mid-priced 10x42 binoculars don't have long enough eye relief for glasses. Highly recommended. 10.5x45 For the person who is looking for maximum hand-holdable magnification and who has very steady hands (or who plans to stabilize the binocular on a tripod). It is the same size, weight, and price as the 8.5x45, with the same 45mm objective lenses. Eye relief of 16.5mm will work for most glasses wearers. Pro: Exceptionally fast focus; 19mm eye relief; wonderful ergonomics, with slender, easy-to-hold barrels; great value for the money. The Viper tied for top place with the Vanguard Endeavor for best resolution score and came in second overall. The Viper got a perfect score on fit-and-feel. Its overall score was lower than the Vanguard’s only because the Viper’s diopter adjustment doesn’t have a scale. The main difference between the two models is that the Viper is the smaller, more compact solid-bridge design, and the Vanguard is the longer, single-hand-grip, open-bridge design. At 5.1 feet, the Viper’s close focus beats the Vanguard, and the binocular is a little lighter weight and more compact. It also has slightly longer eye relief. The focus knob is pleasure to use: grippy, smooth turning, with just the right degree of easy resistance, and perfectly free from slack. It takes 1 ¾ turns to go from lock to lock, with the first ½ turn used to traverse from the minimum focus of 5.1 feet to 8 feet. Pro: Excellent optical quality and ergonomics; 20mm eye relief; 5.1 foot minimum focusing distance. Manufacturer’s unlimited lifetime warranty is unsurpassed: Vortex promises to repair or replace accidentally damaged Viper binoculars at no charge, and the warranty is transferable. In the photo at right, see how far the eyepiece glass is from the top of the eyecup in the conventional binocular, on the right side of the comparison photo? Compare that to how close the glass comes to the top of the eyecup in the Zen ED3 binocular at left. This design provides a couple of extra millimeters of eye relief. A best buy. The Monarch ATB earned an excellent 4.5 optical resolution score, earning a fourth place overall rating, while competing against binoculars costing up to twice as much. 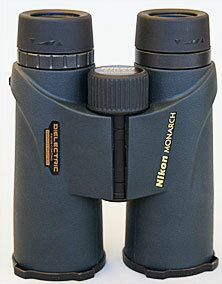 At 21.5 ounces it was the second lightest-weight binocular in the survey. It’s hand friendly, with lugs that don’t poke the hand, eyecups that twist-click up neatly, outstanding 19.6mm eye relief for eyeglasses, and one of the smoothest, most precise focus knobs of the lot. Focus knob turns 1 ¼ turns lock to lock. Beginning in January 2012, the Monarch ATBs will be renamed the Monarch 5 Series. They will sport a new logo on the body but will be otherwise unchanged. Pro:Long eye relief; light weight; outstanding value for a low price. A new open-bridge design, the Eagle Optics Ranger ED is different from the previous, solid-bridge Rangers, which are still available. Since this review, the 8x42 version has been discontinued. However, the 10x42 version remains available. The binocular provides an extremely satisfying view, the product of its excellent resolving ability and one of the widest fields of view (425 feet) in our survey. The Ranger ED seems to have excellent build quality as well. All the moving parts function smoothly and neatly, from focus knob to diopter adjustment. Ergonomically the binocular is well designed. The focus knob is smooth and precise, and it’s wide enough even for a person wearing heavy gloves. Focus knob turns 1 ¾ turns lock to lock. The Ranger ED’s barrels squeeze closer together than most binoculars, thereby accommodating even birders with close-set eyes. Like most open-bridge binoculars, it is longer and heavier than binoculars of a conventional solid-bridge design. Pro: Excellent optical quality; wide field of view; excellent ergonomics. Con: Armored coating is harder than some people like; diopter setting doesn’t lock. 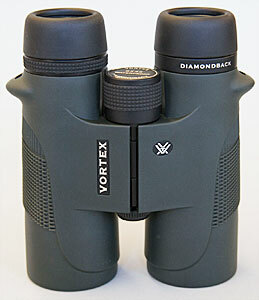 The Diamondback is a notably hand-friendly binocular. The strap lugs are close to the eyepieces, so they don’t cut into your hands, and the armored coating swells out and covers them, making the binocular exceptionally comfortable to hold. The diopter adjustment has no lock, but does have enough turning resistance to keep it from being accidentally moved. Focus knob turns 1 ¾ turns lock to lock. The Diamondback sports a wide 420-feet field of view. The 18mm of eye relief is enough to make it good with eyeglasses. 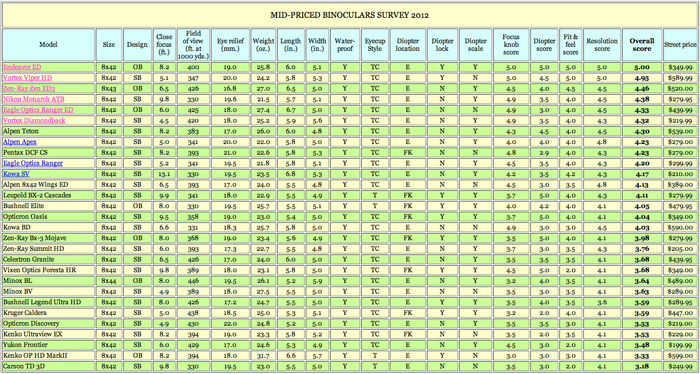 Pro: Long 18mm eye relief; wide field of view; lowest priced binocular in our top ten overall scorers. 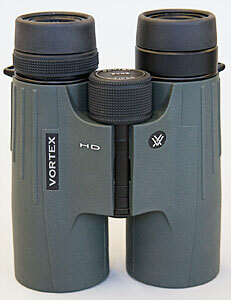 Mid-sized binoculars are small, lightweight, and economical, and they have a wide field of view. 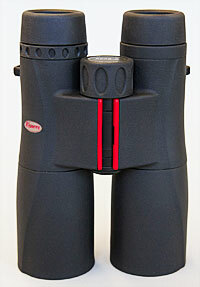 They're an ideal traveling binocular and plenty good enough optically to replace a full-sized one. Remember, a binocular you don't have with you is worthless, no matter how good it is. You may think that you're absolutely stuck on your full-sized binocular, but the next time you're in an optics store, give a good mid-sized binocular a try. You may just end up walking out with it.